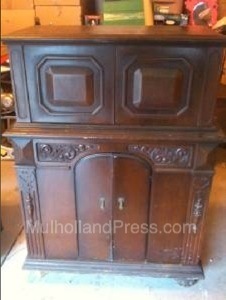 The style 510 was one of the most enduring of the company’s cabinet styles. It was offered from the beginning through at least 1937. It was one of the more expensive styles, beginning at $295 and inching up slightly to $329.95 by 1937. The earliest models carried a Patterson 8 tube chassis, while Philco era models carried a similar sized chassis. 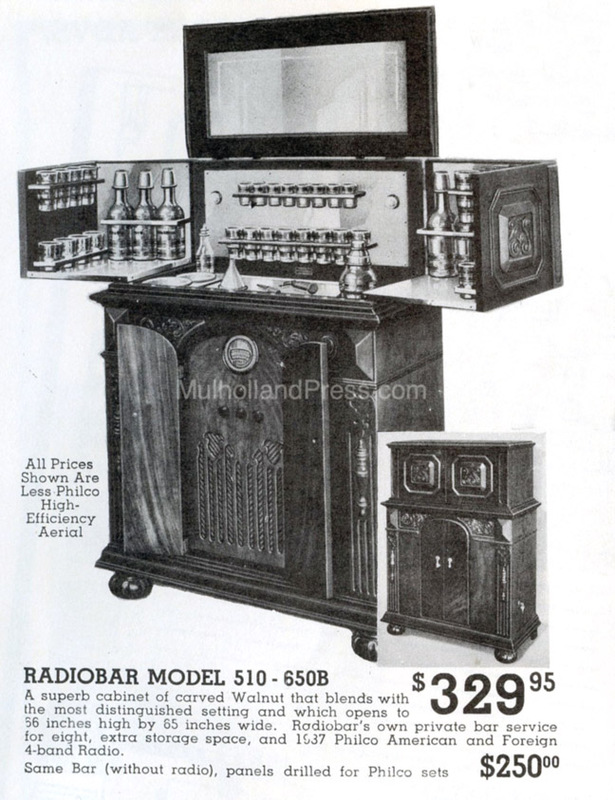 In 1937, as an example, the Philco 37-650 8 tube chassis was used. 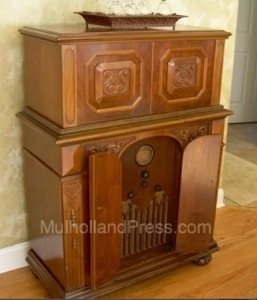 The radio could be upgraded by the Philco dealer to any of several chassis, and this model has been found fitted with the 11 tube model 116 chassis, one of Philco’s top chassis for 1936. Subtile changes to the decoration on the cabinet can be noticed through the years. 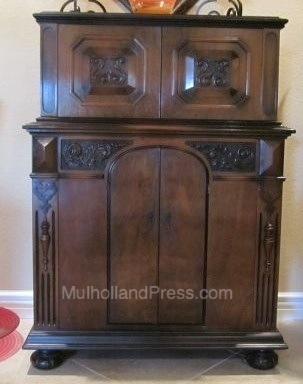 The walnut cabinet was 49 1/2” high, 37 1/4” wide and 18 1/2” deep closed. In open position the cabinet was 66” high and 65” wide. The early versions came with eight each of three size glasses, six decanters, cocktail shaker, polished funnel, ice container, stainless steel knife, bottle opener, corkscrew and refuse container. A deep well was provided for storage of ginger ale or charged water. Later versions were similarly equipped except that there were four sizes of glasses (eight each).